What should we give out in our next contest? 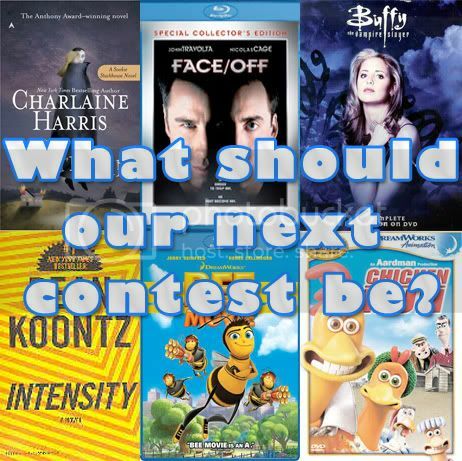 Summer is officially beginning and we are preping our first July contest and we’d like to hear from you guys! Please post a comment below with which item you’d like us to give away in our next contest. Thanks! “Dead Until Dark” by Charlaine Harris. This novel is the first in the Sookie Stackhouse series that the hit HBO series True Blood is based on. If you are unfamilar with the series, it is based around a small town in Louisiana and how it is effected after vampires “come out of the coffin” and into the public eye after a synthetic blood is developed. Face / Off on Blu-Ray. My favorite John Woo film stars John Travolta as an FBI agent who must do the unthinkable to stop an evil terrorist’s plan, he must become him. The disc contains a bunch of special features that you’ll never watch including commentaries by the director/writers, deleted scenes, an alternate ending, the trailer and more. Buffy the Vampire Slayer season one DVD. The classic vampire series by Joss Whedon focuses on the slayer (Sarah Michelle Gellar), one girl in all the world that is chosen to fight vampires and other demons. Bee Movie on Blu-Ray. This charming animated film is from the mind of Jerry Seinfeld and co-stars the voice of Renee Zellweger. The disc contains a bunch of features including storyboards, triva, commentaries, deleted scenes, and an alternate ending. Chicken Run on DVD. This stop motion animation from the creators of Wallace & Gromit stars the voices of Mel Gibson and Timothy Spall. Included in the special features is a “read-along” of the script. So, which of these items would you like to see us give away? Don’t forget to vote in the comment section of this article! Chicken Run is an underappreciated animated film. It has Mel Gibson! And he doesn’t get drunk and yell slurs at people! You can’t beat that. Face Off, that movie rules! Dead Until Dark! True Blood is great! why not, chicken run dvd! It looks like we’ll be giving away Face/Off on BluRay in July! Stay tuned for details.